There’s no doubt you can probably get a pretty inexpensive new kitchen if you were to go with prefab cabinets, but are they worth it? Is the quality or prefab cabinets as good as custom cabinets? Will they last? Are they as functional? Do they look as good? Will they even fit? Let’s address these issues one by one. Consider how prefab cabinets are made – in an assembly line. Quality is never as good in an assembly line of workers who only know their one small task. Better quality can be found in the hands of an experienced craftsman who takes pride in his work and sees that every detail meets the specifications, and that includes not just manufacturing but also materials. Prefabricated cabinets come in standard sizes, usually in 2-3 inch increments. What if your kitchen is not a standard size? Most aren’t, so when cabinets don’t fit, you will be required to buy filler strips to fill spaces. Custom cabinets always fit – exactly, with no wasted space. A custom built kitchen makes good use of every available space. We’ve seen first-hand that the durability of prefab cabinets is just not as good. Materials are cheaper and the labor is not as skilled, so they tend to break down. Sometimes they even come broken after the long trip from overseas. Things we’ve seen are split seams and doors and drawers out of plumb so they no longer close. When we build custom cabinets, we make sure to use the finest quality wood, hardware, glues and finishes because we want our cabinets to last. Yes, you can get an inexpensive prefab kitchen, but are prefab cabinets really that much cheaper? The answer may surprise you. If you’re considering buying prefab cabinets, send your specifications to a custom cabinet maker to bid. You might be pleasantly surprised that for the same amount of money or maybe even just a little bit more, you might be able to get EXACTLY what you want! And don’t forget that when you compare bids to compare apples to apples. There are some beautiful prefab cabinets available but you’re limited in choices. 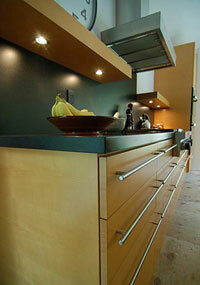 When you choose custom cabinets, your imagination is the limit. You can have anything you want. Bring us a picture, and we’ll copy it. Bring us your imagination and we’ll bring it to life. So what’s the answer? Which are best? Prefab cabinets or custom built? The answer is obvious. On all counts, custom cabinets are always better. And we’re not the only ones who think so. Check out these other reviews. Call 831.335.5533 to set up a no-obligation meeting today. We’re happy to come to your place to discuss your custom cabinet needs.